The issue begins with Superman rescuing and repairing a submarine. As he saves the lives of the crew, Lois calls him worried that he's working too hard lately considering the events of the last couple months. Before the Man of Steel can return home, his super hearing picks up the sounds of screams and gunfire. Without a moment's hesitation, he springs into action, making a beeline for the Caucasus Mountains. There, he finds terrorists and wolves attacking innocent civilians. The Last Son of Krypton makes short work of the assailants before noticing mind-controlling microchips on the sides of their necks. Superman realizes this incident was the work of the Machinist and demands the villain reveal himself. As is common practice with the Machinist, the real guy isn't who's behind the mask. A quick zap of heat vision and the attackers pass out. As the civilians regather themselves, one of the locals directs Superman's attention to a TV where an attack of a similar nature is occurring in Germany. Superman closely examines the microchip only to discover that they were manufactured by LexCorp. The Action Ace promptly makes his way to the LexCorp tower to confront Luthor. Luthor claims innocence in the situation, insisting that his work was stolen. After a brief back-and-forth, the two decide to team up to resolve the issue. Using a tracking device, the two come up on the Kashmir/India border where Lex is shot down by a barrage of missiles. The Metropolis Marvel saves Luthor before he hits the ground, only to find an army of militarized tigers and elephants. The two spring into action as the Machinist appears. Just as Lex goes to put up a force field to protect himself, he is hit with a microchip. Now under the Machinist's command, Lex Luthor is ordered to kill Superman. Story - 4: As much as I've been enjoying the Rebirth/Mr. Oz story threads that have been running through Action for the past year and a half, this is a nice change of pace. This also marks the beginning of a new era for the title as Dan Jurgens is no longer in charge of storytelling duties. While I will certainly miss having him doing a Superman book, it's nice to get some fresh blood every now and then. As a reader of many of the Rebirth titles, I am quite familiar with Rob Williams. For the most part, I've been loving his run on the Suicide Squad title. He's certainly a talented writer and I'm interested in seeing how he handles a morally upright character like Superman. It's interesting to see the Machinist back in the Superman books again. Back when he was introduced in Geoff Johns' New 52 Superman run, the character didn't make much of an impression. The idea for a cool villain was there, but he was ultimately there to act as a catalyst for the conflict between Superman and Ulysses. Hopefully Williams does a better job of making the character memorable. It'd be nice to have a set of new, good Superman villains. As far as characterization goes, Williams does a fine job. There isn't much else to say as this is the first issue of both a new run and a new story. So far, this is a promising start. 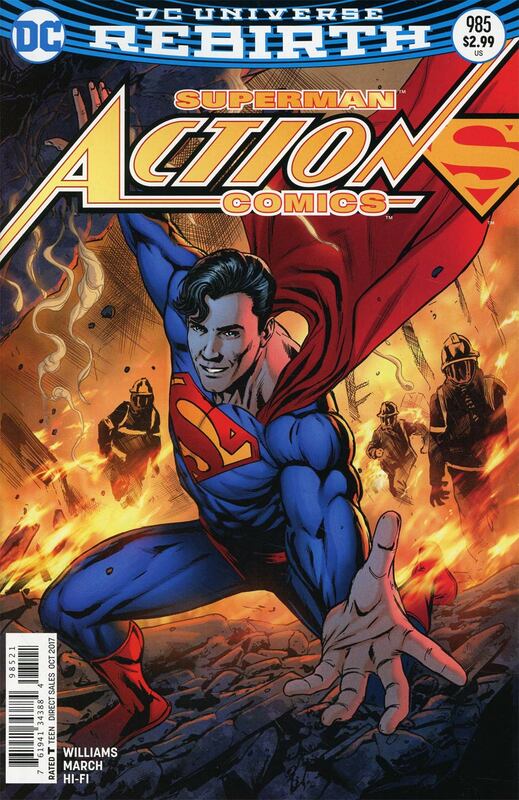 Art - 3: For the most part, I really enjoy this artist's rendition of Superman. 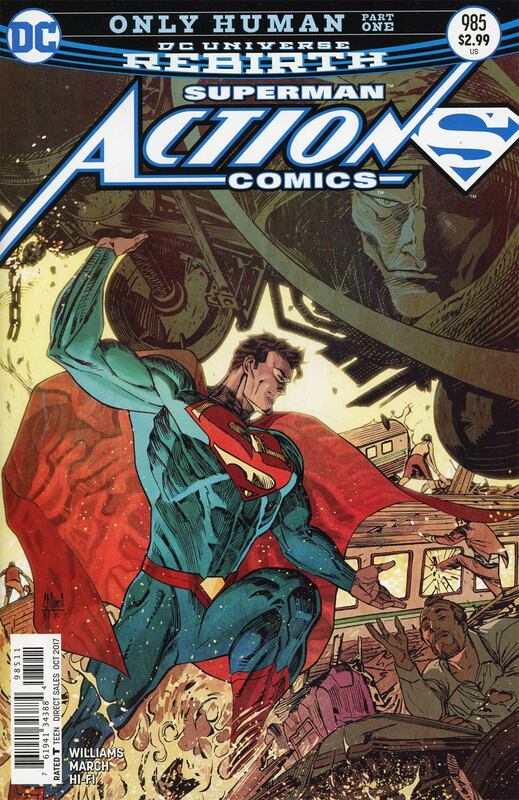 It feels like the amalgamation of Neal Adams, Jon Bogdanove, and John Romita, Jr., with a hint of Adam Kubert. There are some fantastic panels that look like they were inspired by 90s Superman and that's perfectly fine by me. Cover Art - 3: This cover is alright. It's a well-drawn piece, but something about it doesn't entirely work with me. Perhaps it's the face in the top right corner. I can't tell if it's the Machinist's actual face or if it's supposed to be Luthor. Variant Cover Art - 4: I much prefer this cover. The lines are cleaner, the colors pop a bit more, and Supes is flashing a reassuring smile. What's not to love?